The second annual Bourbon & Beyond festival makes its much-anticipated return to Champions Park in Louisville, KY, September 22 and September 23 with the perfect blend of bourbon, food & music not found anywhere else in the world. Festival producers Danny Wimmer Presents, culinary curator Edward Lee (The Mind of A Chef) and bourbon curator Fred Minnick have put together another incredible bourbon, music, and culinary lineup for the weekend. World-renowned musicians including Sting and Robert Plant And The Sensational Space Shifters, as well as superstarsJohn Mayer, Lenny Kravitz, Counting Crows and David Byrne, lead the music lineup of more than 30 artists. Tom Colicchio, Stephanie Izard, Aarón Sánchez and Ray Garcia lead the culinary lineup of more than 20 chefs. The world’s largest bourbon festival, Bourbon & Beyond is an annual celebration of the craftsmanship behind award-winning bourbons, master distillers, legendary musicians, world-class chefs, and an unforgettable showcase of the soul and spirit of Louisville, held during Bourbon Heritage Month. In its inaugural year in 2017, the festival attracted 50,000 people from all over the country, offering a series of onsite experiences, including bourbon and culinary workshops. The festival’s centerpiece, the Big Bourbon Bar presented by Louisville Courier Journal, will feature more than two dozen bourbons selected by best-selling author and renowned bourbon authority Fred Minnick, Bourbon & Beyond’s official bourbon curator. Acclaimed Louisville whiskey bar The Silver Dollar will operate The Hunter’s Club, where attendees can find vintage bourbons dating as far back as the 1930s, as well as contemporary collectibles -- which last year included more than 50 rarities. The festival also announces the return of Fred Minnick’s Mini Bar presented by The Bourbon Women Association, which will showcase this year’s craft bourbon selections: Hartfield & Co., MB Roland, Old Pogue, Wadelyn Ranch and Wilderness Trail. 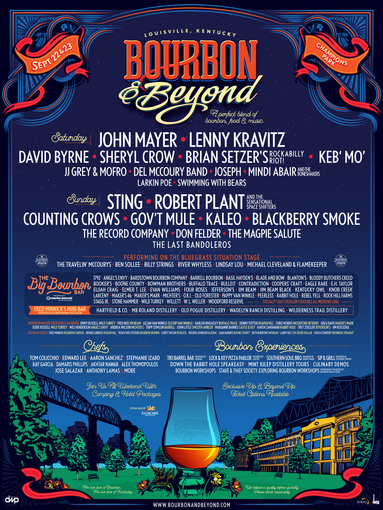 Bourbon & Beyond exclusive VIP packages, General Admission tickets, camping and hotel packages, as well as special event tickets go on sale Friday, April 20 at 12:00 p.m. EDT. Visit BourbonandBeyond.com for more details. Along with world-class musical performances happening throughout the weekend on the two main music stages, The Big Bourbon Bar will feature a bluegrass stage curated by the genre’s leading authority, The Bluegrass Situation, all weekend long. Artists performing include: The Travelin’ McCourys, Billy Strings, Michael Cleveland & Flamekeeper, Ben Sollee, River Whyless, and Lindsay Lou. Louisville has a thriving food scene as recognized by Top Chef, which will be filming their upcoming 16thseason in the city. “The underlying theme of Bourbon & Beyond is a celebration of craftsmanship. I’ve asked our team to approach every aspect of this festival with the same handcrafted spirit that is used by all of the participating artisans. Each and every one of these distilleries, master distillers, musicians, and chefs have spent years mastering their craft. I am honored and humbled that they have agreed to participate in our second year,” Danny Wimmer, founder of Danny Wimmer Presents, said. Bourbon & Beyond has also announced its first official pre-show activities on Friday, September 21, including a Supper Club hosted by Tom Colicchio and Edward Lee, events at the Muhammad Ali Center, an exclusive behind-the-scenes look at local distilleries from Mint Julep Experiences, and bourbon educational sessions from Stave & Thief. "Bourbon & Beyond makes history with our Jack & Jim seminar, which will showcase the world's two best-selling American whiskeys and dissect an often polarizing subject. We want to entertain and educate, but this seminar is taking whiskey discussions to another level and is akin to the Beatles and Rolling Stones sharing the stage,” Fred Minnick said. “This is a rare opportunity to witness a live bourbon event that will never be duplicated." Family Affair: The Van Winkles—The Van Winkle family will have a few stories to tell, such as when nobody wanted their bourbon. My Daddy Was A Moonshiner—Hear how Thomas Wade Daniels decided to break his family nighttime distilling practices and make legitimate whiskey. The Audacity Of Sourced Whiskey—Panelists discuss one of the most controversial whiskey topics of the past decade. We Don’t Need No Stinkin’ Master Distiller—In an industry that covets its master distillers, the truth is, it’s a team effort. Rarest Whiskey In The World—Hidden in local bars and liquor stores are the rarest bourbons in the world. Learn how to spot them. The Joy Of Vintage Whiskey—In basements, at garage sales and even antique shops are old whiskey bottles collecting dust. Hear the story of America’s underground whiskey culture. The Nearest Green Story—Nearest Green was the distiller the world never knew. Until now. Featuring Fawn Weaver, founder of Uncle Nearest Whiskey. Food Pairings: Bird And Bourbon—America’s spirit pairs with more birds than the chicken. Local Grains, Big Fame—Many distilleries have farmer relationships spanning several generations. In fact, some grow their own grains. Bourbon Mixology: Slushie Time—Who knew that bourbon slushies would become all the rage? Bourbon & Beyond sponsors include: Angry Orchard, Bourbon Barrel Foods, Bourbon Women Association, Black Box Wines, Cooper & Thief, Fxck Cancer, GE Appliances, Glencairn, Jack Daniel's Tennessee Whiskey, Kelvin Cooperage, Kentucky Bourbon Trail®, Kentucky Lottery, Kentucky Straight Ice, Lagunitas, Louisville Convention & Visitors Bureau, Louisville Water Company, MillerCoors, Mint Julep Experiences, Stave & Thief Society, Robert Mondavi Private Selection, Southern Comfort, SWFTCharge, Take Me Home, Tito's Handmade Vodka, The Music Experience, and Uncle Nearest Whiskey, with more to be announced soon.